Few shortcomings in your business data protection plan could lead to severe loss of your business and puts other risk along with. Many backup utilities and different other programs could provide only an intermediate level of data protection for your essential data. However, Drive cloning utility can be used to have higher level of data loss protection as it emphasizes on complete system protection by creating an exact replica of the whole drive or any specific partition encompassing all the containing files, folders, application as well as the bootable operating system. For example, you can transfer data and bootable Windows copy from the old disk (HDD/SSD/Flash Drive) to the new disk (HDD/SSD/Flash Drive) and start using system from the new disk with immediate availability of all the data from previous hard drive. 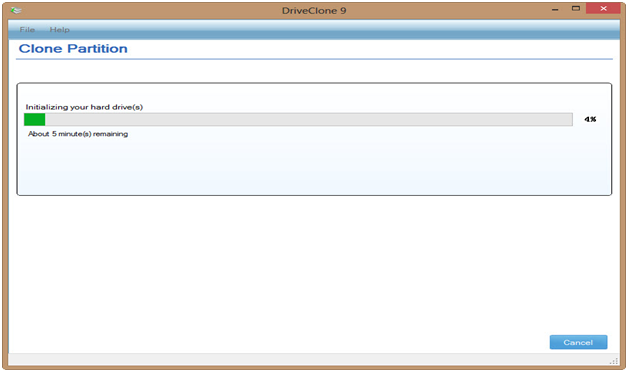 Drive Clone V 9.05 from FARSTONE supports all the latest edition of Windows such as Win 8/Win7/WinXP/Win Vista etc. both 32-bit and 64-bit. Just download this application from FARSTONE Inc. official website and follow simple steps to get it installed on your PC. In between the setup operation, if you’ve the serial keys, can enter the same to activate product immediately and unblock all the premium functionality for lifetime. From very easy to use interface, you can easily get idea about which actions to perform and how to do it better. You can perform cloning either for full hard drive or for any particular partition, by selecting the relevant option: Clone Drive for creating exact replica of entire drive as well as copy bootable copy of Windows. You’ll need to have an equal or higher capacity sized hard disk for this. Whereas, Clone partition option will help you to create an exact copy of any particular partition from the source hard drive and transfer into the same disk or alternatively, save it to another hard drive/ solid state drive or flash drive. Once you’ve chosen the desired option, either Drive or partition cloning, a relevant screen will open immediately. In this review, I’m going to clone a separate partition from hard drive to another partition on the same hard drive. 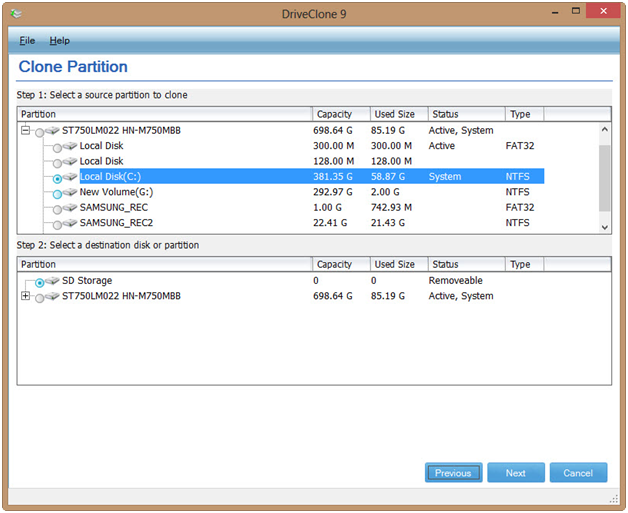 You can select the desired drive from the source partition menu after which, relevant destination drive will automatically lists any suitable place for you to place a copy of cloned partition. Note: Please make sure that you won’t have any important data left on the destination disk as this operation will format the destination drive before putting cloned copy. The software has intuitive interface to guide in between all the steps where guidance is required. See the below image for reference. Drive Clone will powerfully create full copy of any selected regions around the hard drive area while ensuring that no pieces of important data were left. The software offers 14 days fully unblocked software to test the software capability and recommends buying only after getting satisfactory results. I’m pretty satisfied with the overall results and how speedily it completes the whole operation. You can clone drive or partition of 2 TB or more in capacity within a matter of time. More great software’s reviews from FARSTONE were still to come, so hold on your breadth. This is the only product that works for me. I am using Win 8, Dell UEFI laptop.